Russia represents a promising emerging market for machine vision with growth in aerospace, scientific research, defence, security, and traffic monitoring. While the current political and economic environment is making business complicated between Russia and the EU, there are opportunities for machine vision companies in the country, according to Alexei Matveev, head of Business Media Russia, the representative office of Messe Stuttgart in Russia, Ukraine, Belorussia and the Baltic States. ‘On the one hand now we are facing a difficult time [with trade barriers],’ he said, ‘but on the other hand this is a challenge and an opportunity to develop the [vision] market in high gear,' adding that there are still a lot of market prospects in Russia. Business Media Russia supported by Messe Stuttgart is organising the Vision Russia pavilion and conference, which will take place from 17 to 18 June in Moscow. The show will be held in parallel to Semicon Russia, an exhibition for microelectronics and semiconductors. The programme features the latest turn-key machine vision solutions, including integration in semiconductor production. The latest machine vision cameras and image processing systems will be shown during the event. ‘The Russian market offers great potential for the machine vision industry and we encourage foreign guests to benefit from all that our show can offer,’ Matveev stated. The show will have representatives from leading industry associations such as the union of innovation-technological centres of Russia, and domestic suppliers of machine vision systems and components. Matveev commented that there is demand in Russia in areas such as transport, security, research and scientific imaging systems, sports for motion studies, medicine, and cinema for high-speed imaging. He added that there are various industrial applications, including testing of weapons and aircraft engines, automotive crash testing, and diagnostics and adjustment of high speed production and packaging lines. 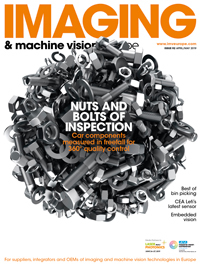 He gave the example of one of the members of an industrial association called 'Mega' delivering thousands of devices with machine vision components to car services. The Mega association is an industrial partner with Business Media Russia and supports Vision Russia, as they consider it to be a necessary tool for the Russian market renovation, Matveev said. Alexei Matveev is head of Business Media Russia, the representative office of Messe Stuttgart in Russia, Ukraine, Belorussia and the Baltic States. The group will organise the Vision Russia pavilion and conference, which will take place from 17 to 18 June in Moscow.